A 70-year old, blond-haired (or is it red?) hotel builder ended up to be “the chosen”. Donald Trump and the gold standard is a good subject to talk about if you look at the election from the perspective of the yellow metal. Judging by what he says, Trump likes the gold standard (and no doubt gold in general, look at the photo on the right) and feels that the country’s flourishing past owes to it. Can you envision a scenario that this country ever goes back to a gold standard? By solid economy, he means that there are not a lot of fluctuations in the economy – financial crises are not frequent and inflation is relatively low. 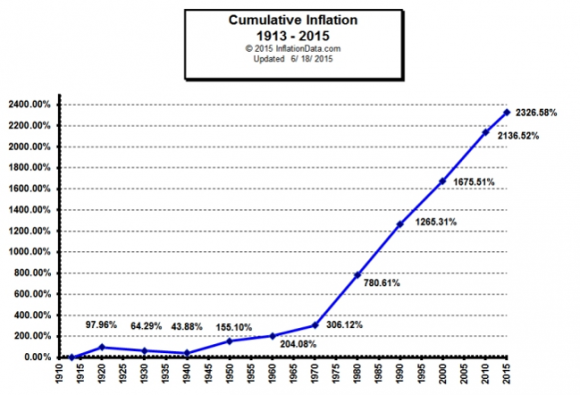 If you go by inflation, ever since the country was set free from gold, that is since 1971, the economy has not been solid or stable. Of course, inflation is just one of the several indicators of the economic stability and not every indicator is in line and directly supports a gold-backed dollar. Bringing back the gold standard would be very hard to do, but boy would it be wonderful. We’d have a standard on which to base our money. The gold standard appeared to be highly successful from about 1870 to the beginning of World War I in 1914. During the so-called “classical” gold standard period, international trade and capital flows expanded markedly, and central banks experienced relatively few problems ensuring that their currencies retained their legal value. The gold standard was suspended during World War I, however, because of disruptions to trade and international capital flows and because countries needed more financial flexibility to finance their war efforts. Actually, it is this classical gold standard period that Trump is referring to in the WMUR-TV interview when he says “but you have to go back at the right time”. If Trump is for the gold-backed dollar, then obviously you would not expect him to speak up for the Federal Reserve. And he doesn’t. He says straight that he is not fan of the Federal Reserve or its current head, Janet Yellen. In fact, he criticizes her for too much “printing”, saying that she keeps interest rates low only so that Obama can last until the end of his term without having recession turn into depression. He even feels that Yellen must be replaced “when her time is up I would most likely replace her” while the Federal Reserve must be audited “Audited, absolutely. I really think you can have it or not have it. A lot of people like it and a lot of conservative people like it. They think there is an adjustment with interest rates and other things. I’m not a fan. I’m not a big fan. Audit, 100%”. … a sophisticated, forward-looking approach because gold is neutral and it’s universal. It’s a well-accepted monetary surrogate that transcends borders and time. If you look at the foreign reserves of the most important countries, they keep them mostly in gold. 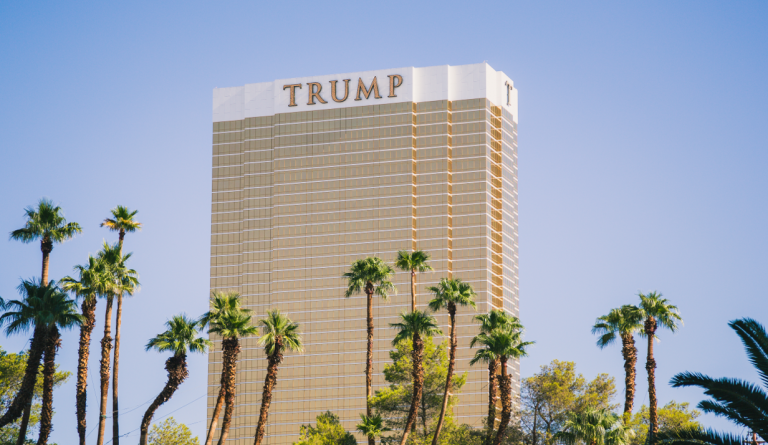 Overall, since Trump announced his candidacy for presidency in the summer of 2015 he mentioned the gold standard a few times and shortly – God knows how serious he is about it. After all he is eccentric in his expressions and intentions and likes to joke. I don’t have credentials nor the interest to go deep into politics or economy but it is clear that Trump is inclined towards the gold-backed financial system more than not. As you can imagine, tying dollar to gold should basically inhibit the Federal Reserve from “printing” too much money. Again, not printing in the true sense of the word, but issuing endless IOUs, that is credit to banks. Consequently, dilution of money supply and rise in prices, that is inflation, should be prevented. Since money printing option (i.e. quantitative easing) would be eliminated, US would need to look for alternative remedies in case of recession. Logically, the US government would be forced to take measures to avoid recession in the first place. For example, before spending gigantic sums on military it would need to think twice. In fact, it did think twice before the fall of the gold standard. Look at the graph below, before 1971 the total country debt was tiny and went nearly perfectly in step with economic growth. You cannot say the same about the debt in the last 40 years or so! However, like Trump says, return to the gold standard would be a challenge. Alan Greenspan, the head of the Federal Reserve who preceded Bernanke confirms Trump’s concerns “A return to the gold standard in any form is nowhere on anybody’s horizon”. 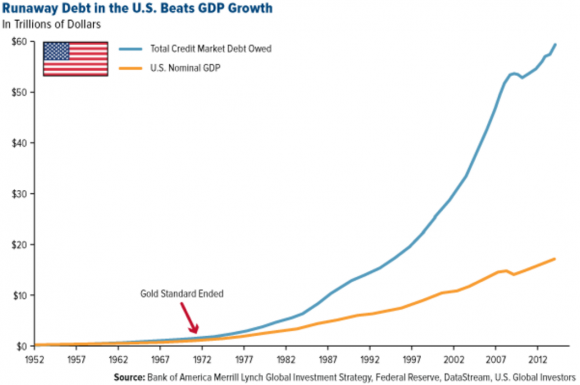 That is because almost 50 years of fiat money system has spurted growths in the direction far too opposite of the gold standard. However, there is nothing new under the sun and you can find similar periods in any book on economic history. I hope you agree that no matter how much longer US goes on the fiat money system there never will be a “point of no-return” to the gold standard. Moreover, the longer US goes without the gold standard, the closer it gets to it, just recall the cycle of money that any great civilization naturally undergoes through. Thanks for your thorough discussion of the gold standard and the possibility of returning to it. I remember my grandfather telling me he worked for a dime a day in the 1920s. That might seem like a pittance, but it was a real silver dime and everything was priced accordingly. Most of all, the central bankers did not have a stranglehold on our economy. Thanks for sharing Gary. That’s how things were a long time ago, sadly, since then time has eaten away the integrity of the US government. Now, work is done for paper.